Michiel Eikenaar, singer of Dutch black metal bands Dodecahedron and Nihil, passed away on Friday. 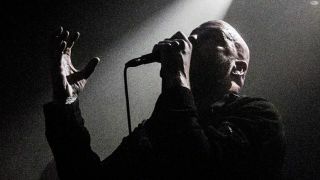 Dodecahedron's label, Season of Mist, announced the tragic news prior to the band's set at Roadburn – which went ahead without the vocalist as an homage. Eikenaar's Nihil bandmate, Vincent Koreman, tweeted on behalf of the band: "A commanding frontman and fantastic lyricist, a great visual artist, but above all, a big friendly loveable guy. "Death comes for all of us. It comes for the strongest, the brightest and the most loved, and Michiel was all of those things and much more." Koreman also reported, via his Facebook post, that Nihil will cease to exist without Eikenaar, despite them working on their fifth record, Seven Trumpets of Doom, before the news of his passing. The band dropped their debut album, Krach, back in 2007 and quickly garnered a reputation for intense, truly relentless black metal often punctuated with silence and a nightmarish ambience. Eikenaar followed up his work with Nihil by forming the more avant-garde project, Dodecahedron (with Michel Nienhuis and Jasper Barendregtin) the early 2010s. The band went on to record three records. He not only functioned as lyricist and vocalist for both bands, but also as designer. Eikenaar leaves behind his wife and two children.